You are here: Home / Work From Home Jobs / Virtual Assisting / Looking for Virtual Assistant Jobs? Check Out These 38 Legitimate Companies! Looking for Virtual Assistant Jobs? Check Out These 38 Legitimate Companies! If you are handy with a computer, have self-motivation, organized, and like doing something different each day, you may be able to work from home as a virtual assistant! You might already hear a lot about virtual assistance if you’ve searched for online or work at home jobs. There are many opportunities for virtual assistants opening up online, as more businesses turn to the digital world. If you’re interested in a job that allows you some flexibility, while also taking comfort in your home office, a virtual assistant may be the perfect title for you. A virtual assistant is much like an administrative assistant you’d find in a regular office setting. Except, the virtual assistant completes the same tasks from a home office, rather than an on-location office. Virtual assistants will help clients complete a variety of tasks, from making telephone calls to appointment setting to research. One of the most appealing things about being a virtual assistant is the variety in day to day tasks. You won’t have to worry about getting stuck at a mundane job doing the same thing every day! It’s important to note, though, that just because you’re completing tasks for someone else, doesn’t necessarily make you an employee. Instead, most virtual assistants are independent contractors who create their own businesses and work with clients to meet their needs. To be professional so clients take you seriously, you should consider investing in a reliable computer with high-speed internet access. You’ll also need a dedicated phone line that is used for business purposes, only. Before you start looking for clients, it’s important to understand your specific experience and skill set. Your previous work experience can help propel your virtual assistant career in specific industries. Those with a medical background, for example, can be especially useful to doctors or medical practices in need of your services. Once you figure out where your skills may be the most useful, you can then determine where your potential clients may be. 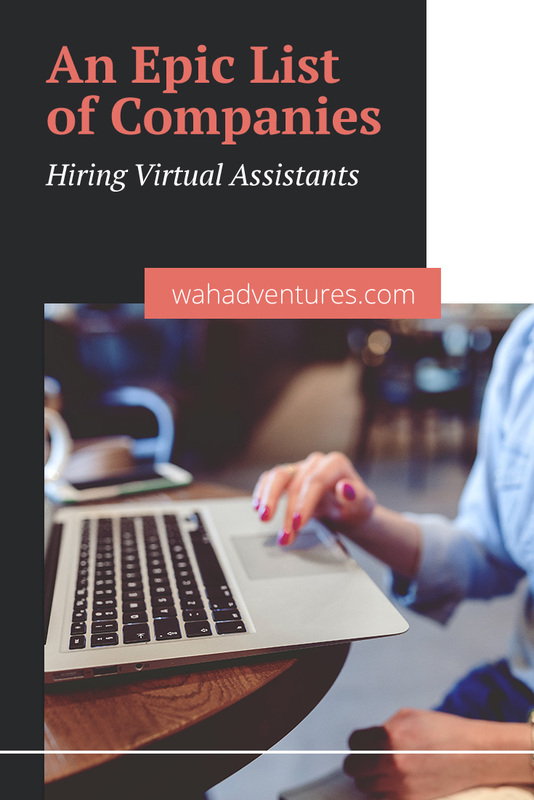 Most virtual assistants have luck finding clients on online job boards, freelancing websites, or through companies that match virtual assistants with clients. Later in this article, I’ll list legitimate websites for you to find virtual assistant jobs. You can also find jobs with local clients through your local newspaper, Craigslist, or visiting local businesses to market your services! Once you gain some experience, you can kindly ask your loyal clients for referrals. If you’ve had an excellent experience with them, they will likely have no problem referring you to other people they know. The opportunities for a virtual assistant are practically endless. Basically, a virtual assistant can offer just about any service that can be done over the phone, or online. As you can see, the sky is the limit for virtual assistants. And the best part is, if you want to offer a service you don’t know much about, you can learn more about it on your own time so you can offer it in the future. Understanding how much to charge is an important part of making your business successful. Fortunately, there are very little costs associated with a virtual assisting business, other than the up-front cost of a computer, phone, and necessary software. You’ll have to spend some money each month on your internet and phone bills, and set aside money to pay self-employment taxes. Other than that, your profits should be yours to keep. But, what is a fair price to charge? As with any business, this depends on your skill set and the type of services you offer. The more well-rounded you are as a virtual assistant, the higher you may be able to charge for your services. Of course, the more in-demand you are, the more you can charge, too! Your hourly rate also highly depends on the websites you use to find clients. Some websites, especially bidding sites, offer much lower pay than others. Once you get some experience under your belt, you may be able to start finding more clients on your own. This is where the best money lies, because you’ll be able to set your own rates. Most virtual assistants charge a per-hour rate by factoring in how long a project may take them to complete, how experienced they are, etc. In 2016, the average hourly rate for virtual assisting was just under $16. However, others comfortably charge $50 or more per hour! Figure out how much you need to make per hour to reach your goal income. Start out on the lower end until you can build up clients. You can then gradually increase your hourly rate as you gain more experience. Where can you find online personal assistant jobs? There are tons of companies that hire virtual assistants, or match them with clients in need. But, it can be difficult to weed out the scams from the legitimate virtual assistant companies. 24/7 Virtual Assistant is a virtual assistant and client matching company. You can send your resume to the e-mail address on the Careers page, and the company will notify you as soon as your skills match the needs of a client. This company is specifically for virtual assistants who are skilled in social media tasks, such as managing a client’s social media networks. You’ll receive pay per client project rather than an hourly rate. Must commit to at least 10 client accounts, but you can take on more projects if you have availability. You can submit your application on the website. Ask Wonder offers a service where virtual assistants are tasked with researching information needed by their clients. There is no work commitment as researchers for Wonder can work as they want and from where they want. Assistant Match helps virtual assistants find clients, while providing training and resources to help them excel in their careers. Register on the website to get access to job opportunities. Belay carefully matches virtual assistants with the perfect clients in need of their skills. You will also get a “Relationship Manager” that can help you navigate any problems you may encounter with a client, to make sure you both have an excellent experience. You can search the website for its current available openings for virtual workers, like a general assistant or bookkeeper, and apply online. This company occasionally opens applications for virtual assistants. If you’re accepted, CVA will help match you with clients in need of your skills and services. Its clients look for a variety of virtual services, from backend technology to planning or hosting webinars. Continue to check back on the website’s Careers page to see when openings are available. You can use Craigslist to find businesses near you, or across the country, that may be in need of your virtual assistant services. First, choose a city. Then, underneath the Jobs section, you’ll find the Gigs section, which you can browse to find virtual assistant jobs. Just be careful when using Craigslist, that you don’t wind up in a scam. Check a few times each day to keep abreast of the most recent jobs, because the good ones can sometimes go very fast! Equivity hires professional virtual assistants with a college degree to work from home supporting their clients. Fancy Hands is for virtual assistants who would rather have a lot of flexibility by completing small tasks when they’re able. You’ll be doing mostly short tasks that only take a few minutes, like researching hotels or scheduling appointments. Tasks start somewhere between $2.50 and $7, and can go up from there, depending on length and complexity. You can choose the hours and days you work. Firegang has a history of hiring Virtual Assistants to work with their Dental Office Marketing Team. This position does involve being on the phone but the pay is upwards of $15 an hour. Freelancer is a bidding site that matches freelancers with clients. Once you set up your profile, you can search for jobs that match your skill sets and bid on them. Clients will choose to work with you if you meet their criteria. If you like phone work, GabbyVille is for you. This company matches virtual receptionists with clients who need you to make phone calls, answer phone calls, or act as a virtual answering service. If you’re interested in applying, send your resume and cover letter to career@gabbyville.com. GoLance is a freelance bidding site to match you with clients. Virtual assistants can browse the Customer Service, Admit Support, or other categories that match their skills. You can also browse jobs by pay rate, experience level, number of hours needed per week, and more. Guru is another freelance bidding site where you can find virtual assistant work in a number of categories. You’ll be able to see the type of work needed and a proposed pay rate before you apply to a client’s post. Indeed is a job listing website that lists several online jobs, including virtual assistant jobs. Simply search “virtual assistant”, and you can find the most recent job listings for virtual assistants. You can also see if there are any openings for virtual assistants for businesses in your area, if you’d like to provide services for local businesses. This company has been around for over a decade, helping virtual assistants find work. Its assistants seem to have excellent things to say about the company, which attempts to match your skills with clients in need of them. You’ll need to commit to a minimum of 5 hours per week, and you’re allowed to work a maximum of 25. Pay rate depends on the client and project, but people report making an average of about $10 per hour. NS Virtual Services is a multi-assistant company that matches its assistants to the perfect clients. You can apply online and, if the company thinks you’ll be a good fit, you’ll complete a Skype interview to move forward. Office88 hires web designers, graphic designers, secretaries, translators, and proofreaders for its team. You’ll complete an application for the skill you desire, and then you’ll be invited to take a test to gauge your expertise. If chosen, you can create your own schedule to be as flexible as you need. OkayRelax opens up its registration for virtual assistants on an as-needed basis. With this company, you’ll get matched with clients needing a variety of services, like social media management or booking flights and hotels. Outvas enables small business owners and entrepreneurs to outsource tasks to their team of virtual assistants. The company has a large team of hand-picked virtual assistants (primarily based in Sri Lanka) with a range of skills to meet their clients’ needs. Paragon Planners works with skilled appointment setters, event planners, marketers, and other administrative professionals to meet the needs of its clients. You can work up to 35 hours per week. PeoplePerHour is a freelance bidding site where people post “Hourlies” for you to bid on. There are a variety of categories, so you are sure to find jobs that match your virtual assistant skills. PowerToFly focuses on supporting professional women. There’s always variety of professional work from home jobs listed. Red Butler hires people for its teams of virtual receptionists and virtual assistants for its wide range of client needs. You can apply on the website’s “Careers” page, and attach your recent resume. Superhuman occasionally has openings for virtual assistants to help the company with its tasks, like scheduling meetings and appointments. You can apply on the website and get notified when you match with a new opportunity. The popular mobile app, TaskRabbit, lets its users find available jobs in their neighborhoods. But, it also has a virtual jobs market, perfect for virtual assistants. You can perform things like data entry, research, or technical help to clients, all through the use of your smartphone or tablet. Team Delegate offers custom virtual assistant solutions to its clients by matching clients to assistants with the skills needed for their projects. Check back with the website to see when openings are available. Time Etc. hires those who have had some type of experience in administration work, personal assisting, or virtual assisting. Must be able to work during the week for at least 3 hours each week. UAssist.Me says that it always looks for new assistants to join its team. Most assistants will be required to work specific shifts, Monday through Friday, so this one may not be best for those looking for a lot of flexibility. Upwork is one of the most popular sites for freelancers, with hundreds of jobs posted each day in a variety of categories. As a virtual assistant, you can choose the types of jobs you want to browse and propose a bid for matching jobs. Upworthy has hired Virtual Assistants from time to time. The benefits and flexibility offered by Upworthy make this a desired position by many. Vicky Virtual focuses on assisting clients with phone calls and answering services, so this opportunity is best for those with strong phone skills. Must be able to type at least 50 WPM. Pays a flat rate of $10 per hour. Virtual Assist USA assistants are skilled in a variety of areas to meet the needs of clients. You can inquire about open positions using the contact form on the website. Virtual Gal Friday is a little different from other companies, in that it hires assistants as employees, rather than independent contractors. However, it does state that you can work with its clients outside the company, if you choose, as long as your work with the company isn’t affected. You can submit your information on the website, and someone will contact you if you’re a good fit for the company. This company hires virtual assistants who are skilled in real estate matters, like bookkeeping, setting appointments, and buyer and seller calls. Work starts at $9 per hour, is paid weekly, and offers flexible hours. You’ll be a Virtual Business Assistant with Worldwide 101, earning between $15 and $20 per hour, depending on your experience and performance. You can fill out an online application, and expect to hear back in about 14 days if you’re a good fit. Zirtual occasionally has openings for virtual assistants, which you can find on its Jobs page when available. You must live in the United States and have some degree of college education. As long as you have a few internet, computer, or phone skills, you likely can start a career as a virtual assistant. However, as with any job, the more you learn, the more successful you can be. You can find helpful online resources and other virtual assistants to network with through virtual assistant networks and forums, like Virtual Assistant Forums, VA Networking, and Virtual Office Temps. Additionally, gaining essential skills, like time management and project management, can further your virtual assistant career. I will make sure to share this updated and longer list. Thanks so much Miranda. thank you for always putting this out. i’m praying for the right opportunity so I can be home again with my 3 girls! God bless you for your labor of love! Thank you for the, as you call it, humongous list. I’m just learning more about becoming a virtual assistant. My question is, is there any particulars that you would recommend for new virtual assistants? Or if anyone who reads the comments have suggestions, I would greatly appreciate it. Thank you for putting this list together Miranda. I know some VAs and will pass this on to them in case there are some new one for them to check out. Appreciate you putting taking the time to put this together. Hope you’re having a great week. Definitely an epic list – great for anyone who wants to earn some extra cash. I know a lot of people who have a VA and can’t live without them, so the demand is certainly there! Does anyone know if Vicky Virtual is an employee or contract job? It doesn’t say on their application. Thank you for including our company in your list. We are always on the lookout for qualified virtual executive assistants. Most of our team handle virtual reception and scheduling tasks for our clients. Would you please put a link to our website in the listing? Those interested can click on the join the team link under the contact us button. We do have an HR team that reviews every single submission. Thank you for this exhaustive list of work from home VA opportunities. The pain of going through the entire internet is eliminated by reading your blog post. Which one of these allow you to choose the tasks you work on? I am trying my best to avoid phone work, but I love completing tasks on the computer, such as data entry, e-mails, etc. Good list. Hiring a virtual assistant may make our life easier. There are many virtual assistant companies in the industry. But hiring the right one matters. I recently hired an assistant from Habiliss virtual assistant services to work on my internet research task. Now I am able to concentrate on my core work without getting distracted. Might be you guys can give out a try. Thanks for this list sites, Miranda. I would just like to mention also the virtual assistant company that I am working with right now, Virtual Assistant Talent, LLC (https://virtualassistanttalent.com/). We do hire various virtual assistant talents that might be necessary for small and large scale businesses. The pay ranges depending on VA’s skills and experience..
That’s really a great list of virtual assistant companies but if you are looking to hire a cost effective virtual assistant I would suggest Habiliss (habiliss.com) because they are really doing a great job and having a very good brand name in the market. I recently hired an assistant from Habiliss virtual assistant for my start up, I have to say they are doing a good job with by work. I love Uassist.ME, great service and experience. My assistant helps with my emails, social media, business & personal meetings, etc.